The whole purpose in starting the business is to bring jewelry which is not widely available in Finland. I have spent long hours combing the search results online and the shops in different cities in Finland and I have discovered that, with the exception of a few major companies, who have their own factories and designs, most of the shops around here have very similar jewelry to each other. I have discovered by asking around in shops, that they don't have or have not heard of Murano glass. Murano is a series of islands linked by bridges in the Venetian Lagoon, northern Italy. It lies about 1.5 km north of Venice and measures about 1.5 km (0.93 mi) across with a population of just over 5,000. It is famous for its glass making, particularly lampworking. Murano's glassmakers were soon numbered among the island’s most prominent citizens. By the 14th century, glassmakers were allowed to wear swords, enjoyed immunity from prosecution by the Venetian state, and found their daughters married into Venice’s most affluent families. While benefiting from certain statutory privileges, glassmakers were forbidden to leave the Republic. Murano’s glassmakers held a monopoly on high-quality glassmaking for centuries, developing or refining many technologies including crystalline glass, enameled glass (smalto), glass with threads of gold (aventurine), multicolored glass (millefiori), milk glass (lattimo), and imitation gemstones made of glass. Today, the artisans of Murano still employ these centuries-old techniques, crafting everything from contemporary art glass and glass jewelry to Murano glass chandeliers and wine stoppers. 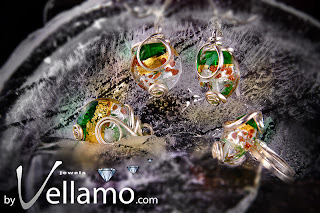 The Murano jewelry currently on the website contains original Murano glass from Venice, with silver filigree inside, which gives the glass a nice shine.